CLEVELAND, OH -- Houston Astros manager A.J. Hinch knows appearances don't count for much at this point of the season. 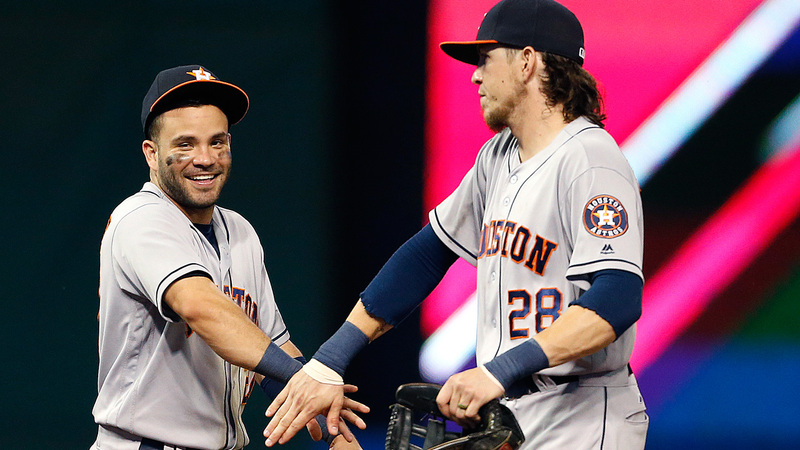 Monday night's 6-2 victory over Cleveland kept the Astros two games out of the second wild-card spot in the AL. It was a game in which the Indians used eight pitchers. "It's a big win for us to come here and beat a first-place team, so regardless of how they line their pitching up you have to win as many games as you can," Hinch said. Rookie Alex Bregman continued his hot hitting with a two-run homer in the third inning and the Astros ended Cleveland's six-game winning streak. The teams combined to use 13 pitchers in a game that lasted 3 hours, 44 minutes. "That was the lovable September marathon we all enjoy," Hinch said. "Better to be on the winning side than the losing side, but that one seemed like it was never going to end." The Indians took struggling right-hander Josh Tomlin out of the rotation last week, resulting into what amounted to a bullpen game for the AL Central leaders. "If you ask about every pitcher, we'll be here all night," Indians manager Terry Francona said. Mike Fiers (10-6) allowed two runs in five innings and defeated the Indians for the second time this season. Mike Clevinger (2-2) allowed a run in the first and was pulled after 1 2/3 innings. Mike Napoli hit a solo homer -- his 30th -- in the fifth for the Indians, whose lead over Detroit in the division was cut to 4 1/2 games. Jose Altuve, the AL's leading hitter, was 2 for 5 with an RBI double and is batting .346 for Houston. Bregman drew a one-out walk in the first and scored when Altuve doubled. Bregman's home run came off Jeff Manship, who relieved Clevinger in the second. The Astros called up Bregman, who has reached base in 19 consecutive games, from Triple-A Fresno on July 25. "It's been fun because we've been winning," he said. "That's all I'm focused on. I couldn't care less what my numbers are at the end of the year." Houston added three runs in the seventh on Yuli Gurriel's sacrifice fly, a throwing error by Cleveland second baseman Jason Kipnis and an infield single by Colby Rasmus. Clevinger made his sixth start of the season, but first since Aug. 13 after five relief appearances. Tomlin, who was 0-5 in six August starts, allowed an infield single in the ninth. Perci Garner, Joe Colon, Dan Otero, Bryan Shaw and Cody Anderson also pitched for Cleveland. Tuesday's scheduled matchup between the last two AL Cy Young Award winners won't happen. Dallas Keuchel, last season's winner, has returned to Houston to have his left shoulder examined. He won't face right-hander Corey Kluber, who won the award in 2014. The Astros have no timetable for how long Keuchel will be sidelined. Astros: C Jason Castro (bruised knee) was unavailable for the second straight game after being struck by a foul tip Saturday at Texas. Evan Gattis started behind the plate. Astros: RHP Brad Peacock will be recalled from Triple-A Fresno to start Tuesday. He has made five relief appearances for Houston this year, posting a 3.86 ERA over seven innings. Indians: Kluber (15-8) is 7-0 with a 1.94 ERA in his last 10 starts. The right-hander hasn't lost since July 3 against Toronto. Kluber allowed five runs in 2 2/3 innings against the Astros on May 9, his shortest start of the season.